If there's one thing compiling the Fable III Frankenreview has taught me, it's that even the most powerful monarch is subject to the court of popular opinion. In this case the court of popular opinion features the opinion of the assembled video game reviewers, who seem to have mixed feelings when it comes to the kings and queens of Albion. The would-be monarchs of Peter Molyneux's making have been weighed, measured, and have been found anywhere from the mid-50's to the upper 90's. Fable has always been about telling an epic tale of humble beginnings and grand conclusions, and while the beginning is less than humble this time around, the conclusion aims to be grander than ever. 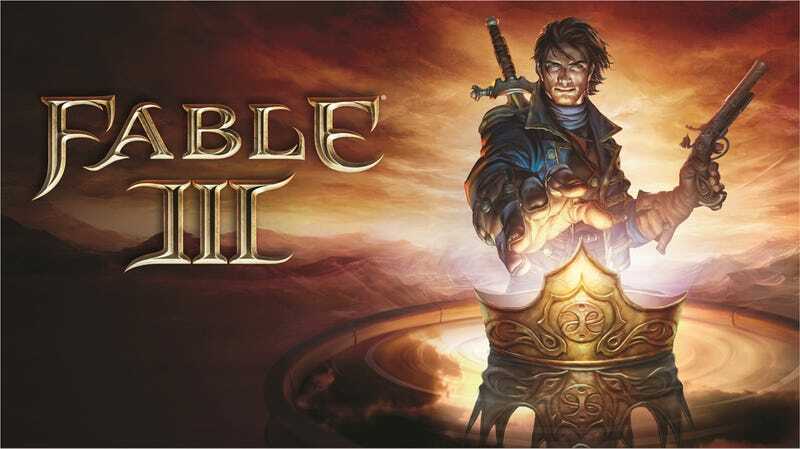 Fable III casts players in the role of a prince of the realm who finds himself starting a revolution to depose his tyrannical brother and, ultimately, become king. It should have been the ultimate realization of everything the franchise has built towards, as players finally get a taste of true power. So what went wrong? Why is it that Fable III, in its attempt to be bigger and more powerful than ever, is actually the least significant and weakest entry in the series yet? Streamlining and simplifying the user interface is a noble goal, but I really feel like Lionhead threw the baby out with the bathwater here. In-game, you no longer see helpful things like a life bar, so you never know exactly how close to death you are, nor how many health potions you have remaining (unless you're in battle), so you don't know when you need to go buy more. But you do see an enormous reminder containing your current quest's name and description that takes up at least the top fifth of the screen. That thing never seems to go away when you want it to. And while the game will occasionally pop up D-pad shortcuts to things like the map, they only appear when some sort of internal logic deems them necessary. Why shouldn't up on the D-pad always take you to the map, instead of only when the game thinks you might want to see the map? It's an unfriendly and downright baffling way to handle the interface, which should just quickly lead you to basic, important game functions instead of only dangling them in front of you from time to time. It's a shame that Fable III can't conjure any deep feelings for its funny-though-forgettable characters, but that's not to say you won't be emotionally invested at all. This is a gorgeous game. The exaggerated, almost eye-popping visuals of Fable II have been subdued somewhat in the latest adventure, and it's a change for the better. Every place you travel to has its own unique look and feel, and it's an undeniable joy to scour the lands for no other reason than to take in the beautiful sights. It is the breathtaking vistas and enchanting forests that pull you in; the smog-filled sky in Bowerstone or the sandy dunes of Aurora keep you engaged. Though your heart may not twinge for the characters you meet, the stirring score does an great job of making it flutter in your chest. Fable III is happy or somber, scary or uplifting, and it pulls off these emotional changes through careful artistic design and empowering music. Walking through Albion is to walk through the pages of a fairy tale. This meticulously constructed world is so enticing to look at and so pleasing to the ear that it makes up for the lack of depth in the other areas. Unlike most fairy tales or games, simply becoming the king or queen is not the end. All of the campaign promises you made and people you met will come calling with demands and you'll be tasked with running the show. This is a portion of the game that feels wholly unique, and forces the player into making real decisions with real consequences. Though Fable III is not a difficult game — even novice players will likely finish without ever getting knocked out — I found the decisions you have to make to be some of the most challenging and stressful moments in gaming this year. It's emotional and intriguing, and there's no easy way out. Your worth as a ruler will be tested. You can be good or evil, but the question is often more of what you feel is morally right. This section of the game is a fantastic climax — I just wish it was a bit longer. Being King of Albion is properly good fun. No, really - we said in the opener to this review that it's the best simulation Peter Molyneux produced in years, and we stand by that judgement. With the crown on your head and the laws at your feet, you can make direct and significant decisions that immediately change the Fable III world and the characters that inhabit it - and every choice genuinely does have a consequence. Should you pay top dollar to build a sewage plant for the growing stink in Bowerstone Industrial, or simply re-direct it to the marshes for free (upsetting the hippies in the process)? What about drinking laws - will you accept cash to outlaw pubs, or endorse boozing altogether and have villagers puking in the streets? And when, my lord, you're propositioned with a plan to build a brothel on a crumbling orphanage for ridiculous profits, which way will your conscience sway? Shave off Fable III's disappointing end and you'd have a better game, albeit one quite similar to the laudatory Fable II. But the world is boring without experimentation. Fable III is better off with its shaky, risky king phase. The fifth act of this play is still a rough draft. It's nevertheless been built on an impressive set that we can play in for a long time. Those interested in ambitious stumbles should commit to Fable III. Those wanting something more polished can settle for the previous model. You can't please all of your subjects all of the time.